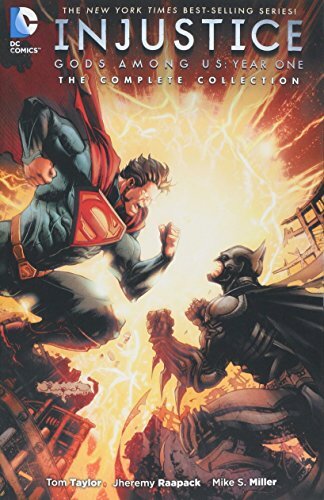 If you don't know this series is a prequel to the video game in which Superman leads a totalitarian regime that polices over the world in order to keep it safe and Batman heads the resistance. This book is how it began. Originally it started off as a digital release so even in one chapter you'll see two different artists and colorists. Considering there's 13 chapters that adds up to a lot of names on this book in regards to the art. Fortunately there's only one writer, Tom Taylor, so at least that's consistent. I only had minor issues with the writing but the art is another story. Speaking of story let's get into it. The book starts with the dystopian future then quickly gets to how it all began. Clark is in bed with Lois when he hears an extra heartbeat. Lois is pregnant. She receives a call for a chance at a story. Clark is weary of it but Lois wins that argument. Superman meets with Batman who is in Metropolis investigating. Turns out the story was a trap. That trap was just a setup by Joker for Superman. When Superman finds Joker he sees Doomsday. 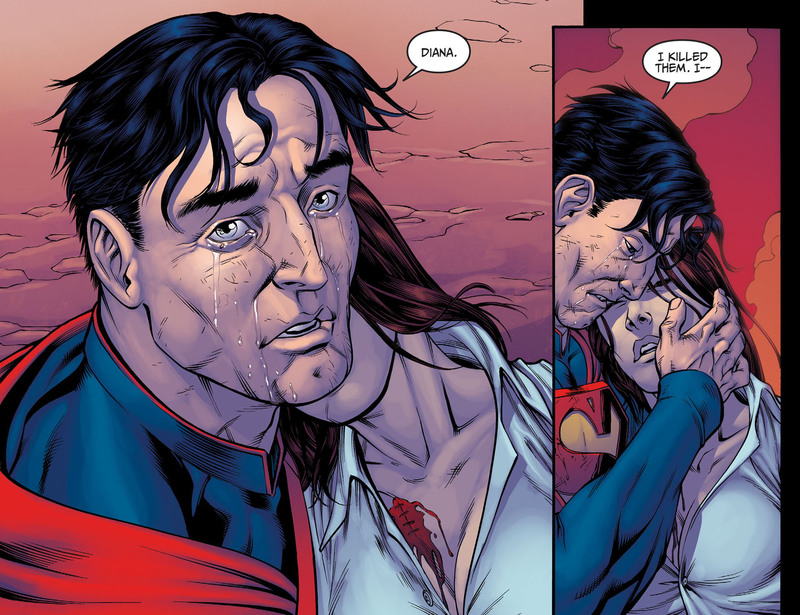 Superman flies Doomsday into space immediately only to realize that when they exit the atmosphere he's holding Lois. As soon as the hearts stop beating Metropolis explodes. That's what begins Supermans crusade to keep the world safe. As the story progresses Superman and Wonder Woman make vows to stops all wars and end all violence. They get in a tiff with Aquaman and Atlantis. 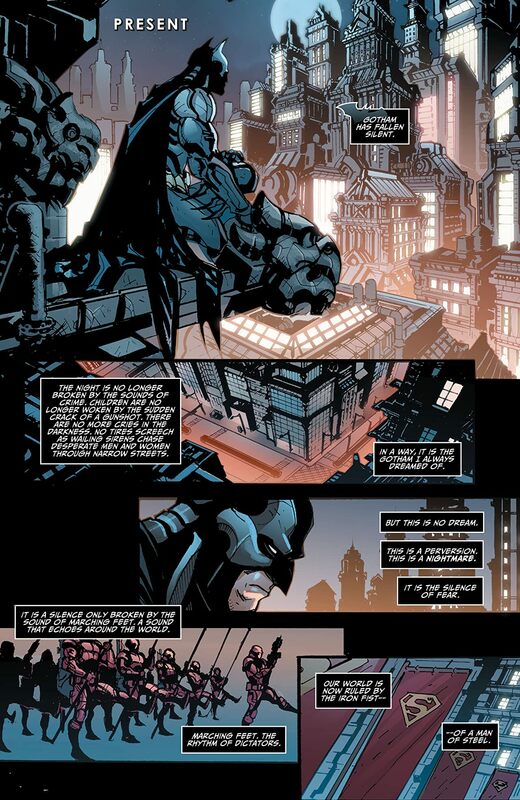 Batman begins a resistance against Supes and his allies. There are casualties close to Bats and throughout the world as Superman forces his will on them. The people see how Clark deals with a world invasion. That results in Superman initiating a plan to have Luthor creat a "Super" pill. Batman scrambles to thwart this plan. Once again the story hearkens back to the game and makes you wonder how and why everyone seems to be on an even keel. In regards to the story it was brilliant for the most part. Since I'm not the biggest DC Comics fanboy I can't tell you whether or not they have done a story like this before but it makes me wonder why they haven't. The idea alone of having Joker mess with Superman sounds great. The beginning of the story is so messed up, intense, and crazy. I loved it. As the Superhero community divides tensions rise and everyone seems on edge. I didn't really care for how one of Batmans allies meets his end. It was very anticlimactic and undeserving of the character. The writer even went out of his way to establish the how and why before the incident and it still left a bad taste in my mouth. Their were a couples characters whose machinations were puzzling to me. Wonder Woman for one almost seemed to be the one pushing Clark to do all this. I know she has a history of being one of the more violent superheroes but she felt too extreme considering nothing really traumatic happened to her in this process. The other was Luthor. I thought Lex always hated Superman so it didn't make sense why he was helping him. If anything this was Luthors worst nightmare coming to fruition and the perfect opportunity to take him down while showing he was right all along. This is a phenomenal piece of working showing what would happen if Superman was pushed to kill. It's actually pretty sad to see the golden boy fall to the dark side. The inner conflict is strong with this one as it makes you shift of what's wrong and right depending on the situation. As far as story goes the issues are far and few but the same cannot be said about the art. If you check the credits there are twelve artists and six colorists on this book. As I said this was released digitally first so that's partially why. I believe these series came out every week or two weeks at first. That's a very difficult time schedule to keep up with for any creator much less art. That being said I can understand that the inconsistencies of the art are part of the nature of the beast. Despite that some of the artists themselves are inconsistent from panel to panel. Some look exponentially better than others and a few just aren't very good at all. For the most part this is a pretty colorful book. As dark as the tone of the writing and story are the color scheme is a little too bright. It does get dark at times and especially towards the end which is when it feels right but usually it seems off. Inconsistencies in the art don't kill the book but they definitely weaken it. What it comes down to is this is a superb story. It's without a doubt the writing is the star of the show here. Knowing that this was a digital release first it was a give in that the art wasn't going to be consistent but for anyone else that doesn't know that that's not an excuse. Knowing is half the battle but with this book there's even inconsistencies with certain artists and colors. This doesn't ruin the book but it lessens the overall quality and therefore impact of important moments. I can't give this graphic novel the highest grade but I can easily say it's a BUY! !